Broadly, we demand that our university demonstrate what should be its inherent opposition, as an educational institution, to Israel’s illegal and shameful behaviours. “The college has agreed to a series of measures to directly address the current crisis in Gaza, including the provision of scholarships for those directly affected by the crisis, and the donation of educational resources to institutions in Palestine”, said Mido Khan on behalf of the student protesters. “In addition, the college has acknowledged the scale of discontent that the award to Peres has generated among the student population, particularly considering the award in the context of what has happened recently in Gaza.” The students agreed to cease their occupation after college management agreed to publish a statement outlining the position of the College on these issues and the humanitarian measures undertaken in the wake of the occupation. 3-LSE Occupation in Solidarity with Gaza! “Nothing we could have said or done would have been enough given the scale of the suffering inflicted on the people of Gaza by the Israeli military but we have achieved a huge victory for Palestinian students and for student activism. That we pressured LSE Director Howard Davies into issuing a public statement is a massive success but given the LSE’s history it shouldn’t have taken an occupation to achieve this. We look forward to meeting the new Palestinian students that our successes on application fees and scholarships will bring to the LSE. Following the actions of Sheffield Hallam students and workers from around the city who voted to occupy the tenth floor of the Owen building to make practical demands of the university in solidarity with Palestinians and to condemn the actions of the Israeli state, the Sheffield Free Gaza Movement was formed to build initiatives and campaigns and continue to put pressure on the university management to fulfil the demands of the occupation. 5-Oxford Occupation in Solidarity with Gaza! In the first week of term, over 80 Oxford University students occupied the historic Bodleian building to demand that the university release a statement condemning the attack on Gaza and cancel the lecture series at Balliol College inaugurated by Shimon Peres. 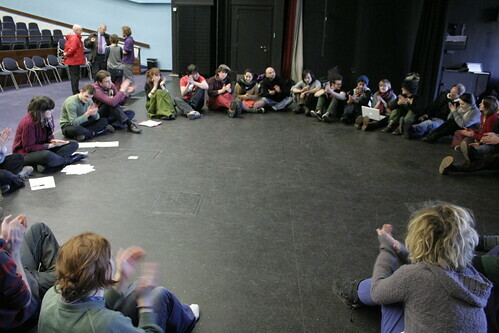 Students organised the sit-in after attending an emergency meeting in Oxford organised to discuss the war on Gaza and the precarious ceasefire. Members of the University entered the Clarendon building and sat down at 1200, British time, on Thursday 22nd January. Their demands were presented to University officials, and by 7pm the same day they acheived victory, putting an end to the occupation after reaching a successful agreement with the university. We as students of Queen Mary are occupying lecture room FB 1.13 in the College to protest against the recognised war crimes in Gaza committed by the Israeli Government, and to show our solidarity with the oppressed peoples in the region. We are pursuing this course of action to maintain the momentum of other student protests in Universities across the U.K.
As students of this institution, we unreservedly object on moral grounds to the University’s failure to boycott goods supplied by companies who fund military operations in Gaza. Furthermore, we have strong reasons to believe the University is financially involved with arms dealers GKN and Cobham. We find this morally unacceptable and ask for complete transparency on the part of the University regarding any investments in the arms trade. It will be our policy to seek to expose this issue and open it up for debate within the College. We sincerely regret any inconvenience caused to either staff or students at our College; however, we have been motivated to act on the basis of our moral convictions. Goldsmiths will establish 4 scholarships, covering the cost of taught postgraduate tuition fees, to be awarded to students who come from all and any part of the world which is affected by oppression, persecution, political or military strife such that their human right to education is denied to them. Goldsmiths will work with its students and other interested parties to establish a charitable trust to raise funds to support the costs of these students’ study – accommodation, travel and living expenses. In the early years of the charity’s operation, if it cannot raise sufficient funds to cover the costs, Goldsmiths will provide funds to enable the students to study at Goldsmiths. Two of the four scholarships will, for the ten years from 2009-10 until 2018-19, be reserved for students from Palestine. Before the 2019-20 scholarships are advertised, there will be a review, which will include asking the student body (and making its assent a necessary condition) to determine whether and for how long the reservation of 2 scholarships for Palestinian students should continue. Goldsmiths will work with Al-Quds Open University and Birzeit University, with which we already have strong academic links, in identifying suitable candidates. The selection panel to agree the criteria for the scholarships in the first instance, and to determine who receives the scholarships on an annual basis, shall comprise a student representative chosen by the students, an academic staff representative, and a Pro-Warden. Over 80 University of Sussex Students have occupied a major lecture theatre in solidarity with Palestine under siege. We, a coalition of SOAS students from many different backgrounds, have resolved to occupy the Brunei Gallery Suite. In line with Student Union motions, our aims are the following..
On Monday, the Vice Chancellor issued a public statement in which he “expressed his dismay at the conflict and the loss of life in Gaza and Israel.” The University has declared that it is “agreeable in principle to facilitating schemes to provide surplus educational materials to Palestine…and that it will discuss with LUU (Leeds University Union) ways of extending opportunities for Palestinian students to study at Leeds.” The University has also stated that it will review its socially responsible investment policy and that it will accept a list of roughly a dozen companies which concern us most and they will inform us whether they do or do not invest in the aforementioned companies. We will actively pursue all of these concessions to ensure that they are followed through. Read their full demands here. 12-FREE MAN MET: Students in Occupation for Gaza! MMU Students are currently in occupation of the Geoffrey Manton building. We are occupying the building in solidarity with the people of Gaza and to stand up to imperialism in the Middle East. We have issued the following set of demands to the Vice-Chancellor because we believe in delivering concrete solidarity for the people of Palestine. I challenge you to help free Palestine! In order to help with the Boycott I’ve chosen one company to focus our energy on. That company is Nestle. Nestle is an easy company to boycott because of their wide range of products. And you usually see Nestle’s name on the front of everything. So you’re thinking how am I not going to have a Kit Kat bar? Well good question, have you ever wondered how the caramel got into a Caramilk bar? Or, You can’t take away Nescafe, what are we going to drink? How about Maxwell house? See you have choices. You can choose the children of Palestine or help their oppressors live the good life with full bellies, clean water, and electricity. It is your choice, to have power and strength or be weak and powerless. I’m going to explain why it will take a few months for Nestle’s to respond to our boycott. – Every month large companies look at how much money they made based on different products and different parts of the world. They compare these numbers to the last month, to the same month last year and what they budgeted. And this is where your efforts come in. When they see that all of a sudden they made less money this month they have to research why. And they actually have to write it down. And what will they have to write why they lost money, it will say BOYCOTT. – So will they listen to us right away? Yes and no, they are going to try and convince us to come back to buy their products. They will do this by having their chocolate bars at 2 or 3 for a dollar. Who doesn’t love a bargain? We don’t love a bargain, we will not sell the souls of the children of Gaza for a dollar. This is the one time where I encourage you to spend more money. They will also have contests to buy their products. Like if you buy three boxes of Nestle cereal you can win a trip to Disney, Hawaii, etc. We don’t need these trips, we need Palestine to be FREE. Do not give into temptation. Remember for 60 years we have resisted their calls to destroy the Palestinian people. We can and will resist their marketing ploys. – They will write on their website and have responses to say that they have operations in each country and that your product is not made in Israel. For example the might say Nestle products of the USA are made locally and do you want local people to lose their jobs in this economy. First the products usually are made locally, but the research of Nestle is done in Israel. So, the Israelis are telling you what tastes good. Are you going to let the Israelis tell us what to do? NO!! As for the jobs and the local economy, well if it means that Nestle has to lay off people that means that the money we spent on Kellogg, Cadbury, etc should increase the number of jobs at those companies so people can go work there. When you take your dollars from one company, you are giving it to another. So you are still helping the economy. Basically they are trying to trick you. But we are smarter and better than that. Now for the challenge. I want all of you to boycott Nestle, all their products and find substitutes. Post this article on your Facebook walls, spread widely in emails, etc. We can help each other. Second everyone is to find three friends and convince them to join the challenge. Do not just forward this message, people ignore them, I know I do sometimes. And ask them to be honest if they are going to join or not. If 2 out of the three will join you need to find a third friend. And you have these friends convince at least 3 friends. Try to find friends around the world to join the boycott. The more people and countries involved the better. Valentine’s Day and Easter is when companies make the most money from chocolate sales. They depend on this money for the rest of the year. The power is ours. Buy Cadbury Easter eggs, Caramilk bars, etc… Let’s win this challenge.